The title of this post is borrowed from Zizek’s 2010 book, a title that accurately describes the irony of a recent ad in the New York Times. 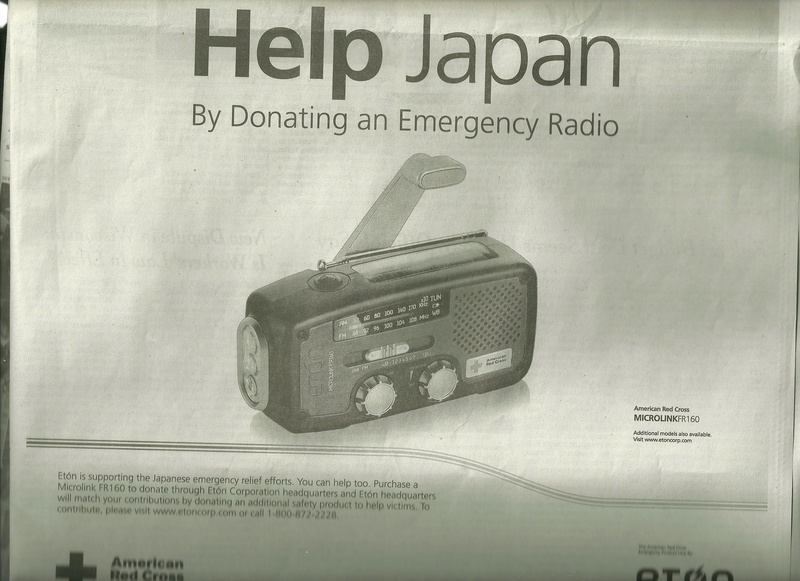 Under the guise of tragedy, Eton Corporation’s “Help Japan by donating an Emergency Radio” illustrates the farce of contemporary consumption and its cultivation of an ‘authentic’ self by promoting consumerism that benefits not just the individual but society at large. This Palo Alto-based company’s ad is simple, aesthetically pleasing, and tangible (I buy this physical object that is then donated to someone who is in immediate need of it), a relief to the thousands of people who want to help but are overwhelmed by the complexity of international aid relief and skeptical of its impact. One major complaint throughout the aftermath of the 2004 Indian Ocean tsunami/earthquake was not that there wasn’t enough aid, but that it wasn’t reaching those who needed it. Eton appeals to the educated consumer who looks at an image of the emergency radio and easily envisions its arrival to a relief center somewhere in Northeast Japan. As often happens in print journalism, the advertisement conflicts with the message of the article in close proximity to it. “Finding Reassurance in Order” is about the ability for daily life (hair cuts, onsens, bicycle repairing, dental visits) to continue thanks to “a passion for order and civility so deep-rooted that the chaos and despair of 1,000 strangers is subdued to the level of disarray expected at the monthly meeting of a book-lovers’ club,”(A11, 3/26/11). I read this and was reminded of the extreme, meticulous disaster preparedness I came across while living in Japan. The first thing my landlord showed me when I moved into my house was the location of an emergency hard hat, flashlight, water, and, yes, emergency radio. So it is with some irony that I turn the page and see Eton’s ad. Sure, part of the proceeds go to the American Red Cross, but just how badly do the Japanese need American (or perhaps Chinese?) made short-wave radios? Of course, anyone who chooses to call 1-800-872-2228 is well-intended, and most likely, so is Eton. A large component to any tragedy is the uncertainty of how to respond. There is the immediate tragedy and then there is the aftermath and the inability to measure if outside efforts are improving or worsening the situation. But, to often, tragedy becomes opportunity. The tragedy-as-farce of Eton’s radio is that in our recognition of tragedy, we unconsciously respond through what we know best–consumption. And, in this way, tragedy becomes opportunity for capitalist investment. The tragedy-to-farce transition Zizek’s title is referring to is the 9/11-to-financial crises, but the essence of the discussion is ideology and how, in its pervasiveness, it appears to us as non-ideology. “Here is an exemplary case of ‘cultural capitalism’: the Starbucks ad campaign ‘It’s not just what you’re buying. It’s what you’re buying into.’ The ‘cultural’ surplus is here spelled out: the price is higher than elsewhere since what you are really buying into is the ‘coffee ethic’ which includes care for the environment, social responsibility towards the producers, plus a place where you yourself can participate in communal life,”(53-4). The argument is that Ethos water represents quality consumption, thus avoiding the infamous alienation Marx ascribed to the commodity. Ethos water, Toms shoes, and short-wave radios are all examples where “we are not merely buying and consuming, we are simultaneously doing something meaningful, showing our capacity for care and our global awareness, participating in a collective project,”(54). Unfortunately (depending on your angle of course), that collective project is all to often the human capacity to consume.